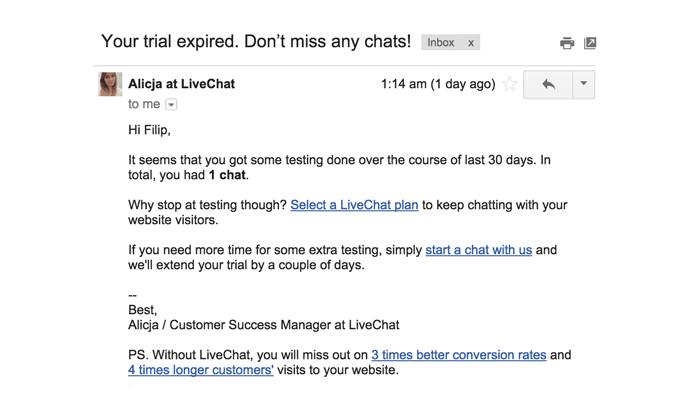 UPDATE: You can easily automate what happens after a chat using channels like email, SMS, and Facebook ads. Join our webinar on integrating LiveChat with Autopilot or see more information on the integration features. We all can name at least one favourite grocery store where we always feel at home. We often go the extra mile to visit this particular place because, at some point, shopping there becomes our habit. This relation is built on a handful of details, one of them being the personal contact with the owner or cashiers. Whenever you return, they recognise you. Over time, they get to know you better and start smiling a little wider when they see you. A loyalty bond is born, which is always valuable for both sides. Does this translate to the online world? It certainly does! With the right tools, this relation model is highly adaptable in the online environment. Join me for a little case analysis to learn how you can create this kind of relation using marketing automation and how to level up your business in the process. Let’s find an analogy that will help you understand the power and mechanics of marketing automation. To make it work, I need you to recall the last time you went out to do some grocery shopping. Focus on all the details: the store name, its look and the arrangement of shelves, the general experience of buying. Being able to notice and understand them is crucial for succeeding in your marketing and customer support strategies. Can you recall what it is equipped with? Could you guide your friend to the right alley to find a specific product? Where is the counter? How long does it take to find and get what you want? Would you recommend this store to your friend? Why? Why not? Did you need assistance or any kind of customer service the last time you were there? Can you see where this is going? That’s right, the same questions would work for your website. Connect the dots and all the similarities will become clear. Now take a moment of great honesty and ask yourself: is the navigation on my website as clear as in my favourite grocery store? Would a first-time visitor find their way through the navigation? Is the stock displayed well? Have you ever asked yourself why is the stock ordered and then spread across the shelfs in a particular way? Do we, as customers, have any impact on the business strategies? We certainly do. In most scenarios we are the key factor that drives every business. While shopping we often tend to rely on others’ opinion or advice. It is quicker and seems more reasonable, as we actually seek for solution to the problem, not the product or service itself. Can you imagine a car a dealership showroom or a real estate agency with self-checkout? In the real life, we are there for our customers. We can observe them and speak with them directly. On the other hand, could you picture a grocery store with thousands of visitors every day? It would be almost impossible to serve them all. The major difference between online and offline business is the scale of the audience. Getting to know your customers when you have a few dozens of them is not that difficult. However, for an online business, it will be a couple of thousands customers that all need the personal approach. Don’t let the technical obstacles get in the way. The ability to study and interact with customer’s behaviour is your superpower. 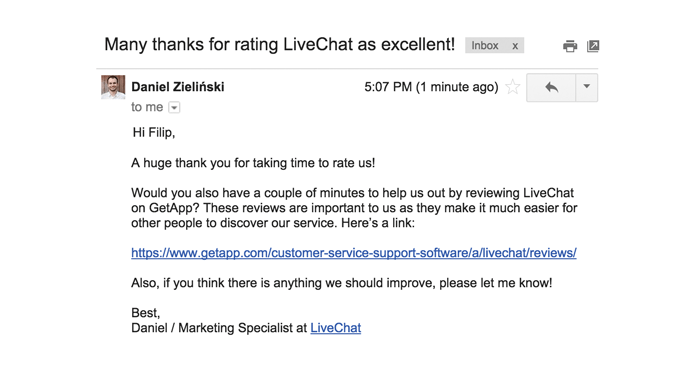 Use it!How do you get around to utilizing these good customer service practices? Well, you need to have the proper tool. One of such tools is marketing automation. 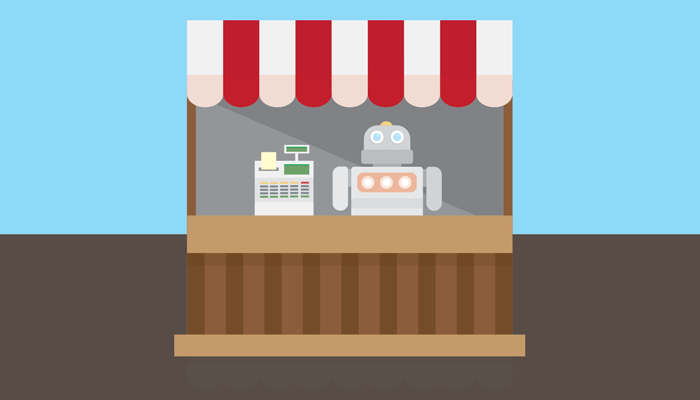 Treat marketing automation as a medium that brings all the perks of real-life customer service to the online world. In addition, it allows you to communicate with online customers in the brand new, more engaging ways. Today’s tools serve you a full range of sorcery tricks on a plate. Imagine how spectacular it would be to predict what customers are going to ask for before they actually do it. How helpful it would be to know the details of their issue upfront, or to reach out to the returning clients before they even notice your presence. Build up the knowledge about your customer base. CRM, marketing automation and analytics tools, market benchmarks and reports, customer service software. Serve two-way communication between customers and your business. When customer returns to your website, they trigger a greeting to appear; when you present them with a special offer, they are triggered to buy. Shape your customers behaviour. Targeted email campaign, greeting for a returning customer, dynamic content on your website. TIP: Learn how to turn your data into satisfaction from our data-driven support management ebook. Is there something you can do to make your customers life easier? Think of any pain-points your customer may encounter (for instance, within the onboarding process). Climb into your customer’s skin using your service, try to guess what problems they may come across and sketch solutions right away. Don’t try to change your strategies all at once – pick one out, make a case, evaluate it and repeat the process. If you struggle to choose, go for the matters that are easy to measure before and after the implementation. When the measuring requires a great amount of work, it’s probably not worth the effort. Why? You cannot easily determine the influence of your actions, nor you can calculate the impact it has on your customers. Start with using the data you have lying around: there are a number of sources to feed into your marketing automation system. It could be your CRM software, analytics platforms, NPS surveys, even simple contact forms and spreadsheets. Make the data work for you! Smart business leaders live off every bit of feedback. They observe, analyse and take notes. The important thing to acknowledge is that you don’t only observe, but you also shape customers’ behaviour. You are in control of what your customers see and interact with. Nihil novi you say? The companies have been shaping (or sometimes even manufacturing) our behaviours for ages. It is the reach, power and medium that changed. The use of marketing automation will let you reach for techniques often unavailable outside the online world. Autopilot’s headsup messages & LiveChat’s greetings. Use the information on your customer activity to send targeted emails. Discover new ways of reaching out to your customers by exploring existing user paths. TIP: Is your business ready for going mobile? Micro-moments are critical touch points within today’s consumer journey, and when added together, they ultimately determine how that journey ends. The adventure doesn’t stop at sending emails – you have to define the goals you want to reach. The essential challenge is to elevate your business to the higher levels. Pick out the KPI which is the most important in your industry; for the support services that would be handle time and customer satisfaction, for sales inquires go for number of cases and conversion rates. You can learn more on what makes online customer service tick in our Customer Service Report 2015. Once the challenges are chosen, be certain to note their current states. Knowing the metrics before and after taking any marketing automation actions is your duty as a responsible business leader. Designing a marketing automation flow is a perfect opportunity for your departments to collaborate. While discussing, you will find out which goals are common for both support and sales teams and which should be separated. Make the most of this knowledge to create a smooth customer experience. Just remember: no matter how big your team is, make sure the particular goals are clear for everyone involved. Document your findings and share the discoveries. Keep all the departments in the loop constantly to let everyone know of the results. Encourage the trial and error approach – there is nothing more valuable than fruitful cognition. Boost your imagination by examining real-world cases. Keep in mind that for an experiment to be helpful, it has to be documented. It can be considered successful as long as the outcome is measurable. Marketing automation makes you more human, because it helps you know and communicate with your customers better. Apart from the grocery store example, there are loads of consumer markets and industries to look to for inspiration. Find your ways to recreate the real-life customer service experience. Perform experiments – they are the key to discover and improve every business strategy! Filip is a software developer with particular interest towards front-end and design. While he’s no stranger to any CSS, he’s keen on data crunching too. As a Head of Developers Program, he takes care of developers’ experience and relations at LiveChat.